Swiftsure International Yacht Race is very excited to announce Navis Marine Insurance Brokers as Swiftsure’s Marine Insurance Provider. Welcome to Navis Marine Insurance Brokers, a Specialty Insurance Brokerage dedicated to providing protection and insurance coverage for the unique needs of marine related clientele. With over 20 years of experience, Navis takes pride in offering our clients specialized insurance packages and policies that help them protect their assets and their businesses. Our brokers have relevant experience that applies to the safeguard of you and your vessel including: building related risk management solutions, recreational watercraft insurance, complex marine operations and high-level knowledge of legal statutes including the Marine Liability Act and the Canada Shipping Act and more. In addition to our professional experience we offer our clients personal and intimate knowledge of the industry including: experience aboard commercial vessels, race management, serving as Commodore of a yachting club, marine search and rescue, extensive experience with pleasure crafts and recreational boating and involvement in marina construction. Being personally involved in sailing, marine activity and boating gives us a critical edge in understanding our clients’ needs and ultimately protecting the assets and businesses they have worked so hard to build. For more information, visit Navis Marine Insurance Brokers. 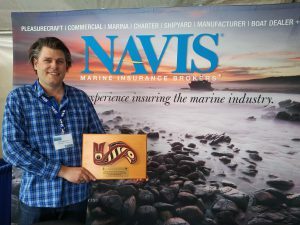 James McDonald of Navis at the 2016 Victoria Inner Harbour Boat Show gladly received the Platinum Swiftsure Sponsor plaque for Navis Marine Insurance Brokers generous support of Swiftsure.